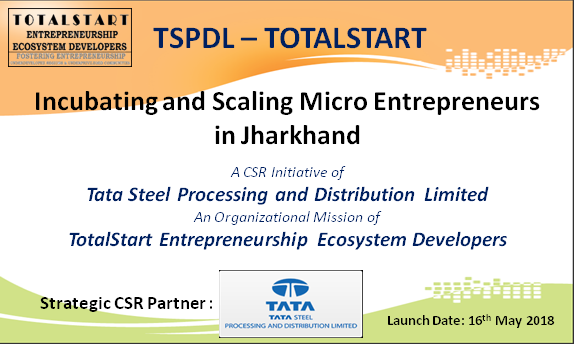 A core team constituting of TSPDL’s Senior Most Managers and TotalStart’s Mentor and Governance Board Members has been formed which will steer, execute, monitor and measure this year long program of incubating and scaling around 20 District Level Micro Entrepreneurs, specifically from the Regional District Hub of Jamshedpur, covering the 2 Districts of East Singbhum and West Singbhum in the state of Jharkhand. The target would be to have at least 50% of the engaged Micro Entrepreneurs in this program from the SC and ST Community from the Regional District Hub, in alignment to the Affirmative Action Focus of TSPDL. The project has been officially kicked off on 16th. May 2018 and the onsite engagement will start from the 1st. week of June 2018. There will be three phases in this project. A 2 month long focussed campaign to catalyse and curate about 100+ Micro Entrepreneurs from the District of East and West Singbhum, by closely working with the District Industries Centres (covering 2 districts) under the Industry and Commerce Department of the Government of Jharkhand, the local District and State level Industry and Commerce Associations, District magistrates Office and any local body which has focus on scalable entrepreneurship development at the district levels. This will be done through several one on one meetings, small engaged workshops and some local ad campaigns through Social Media, and info share pamphlet distribution to local focussed groups. The 2nd phase will focus on 2 full two days workshop for curated 30 micro entrepreneurs chosen from the 100+ micro entrepreneurs with the final selection of about 6 micro entrepreneurs from each workshop, for whom a business site due diligence will be carried out for half day each. At the end of the workshops we will be choosing a minimum of 12 and a maximum of 20 Micro Entrepreneurs who we will be engaging for the remaining of the financial year putting them on TotalStart’s 2 year program for Foundation Building for Scaling and have milestone based growth management path for the each micro entrepreneur. TSPDL is supporting this program not only through its CSR funding, but with engagement of key domain and industry experts from its fold and will provide all opportunity for these entrepreneurs to grow its business as vendors of TSPDL and other Tata Group companies as best possible.